Senior consultant and member of the sustainable mobility/cycling experts team of Royal HaskoningDHV. Aletta has large experience working as a strategic advisor, project and process manager, town planner and developer. With a particular interest for sustainable (non-motorized/active) transport, she has been working in different cycling related projects in the Netherlands and abroad. She developed an extensive network with Dutch as well as international cycling experts. As an enthusiastic leader, with good analytical and communication skills, Aletta can lead projects in an effective and result-oriented manner. - DCE expertise: Urban planning, Sustainable mobility, Integral Cycling Projects, Stakeholder management and Digital Innovation within mobility. 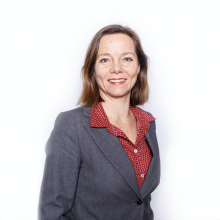 - DCE experience/projects: Between 2013 and 2015 Aletta was the Managing Director of the Dutch Cycling Embassy.